Why You Do Your Best Thinking In The Shower: Creativity & the "Incubation Period" | Open Culture Why You Do Your Best Thinking In The Shower: Creativity & the "Incubation Period"
Are we always doomed to lose the thread when we get self-conscious about what we’re doing? Not at all. In fact, some researchers, like Allen Braun and Siyuan Liu, have observed incubation at work in very creatively engaged individuals, like freestyle rappers. Theirs is a skill that must be honed and practiced exhaustively, but one that nonetheless relies on extemporaneous inspiration. Renowned neuroscientist Alice Flaherty theorizes that the key biological ingredient in incubation is dopamine, the neurotransmitter released when we’re relaxed and comfortable. “People vary in terms of their level of creative drive,” writes Flaherty, “according to the activity of the dopamine pathways of the limbic system.” More relaxation, more dopamine. More dopamine, more creativity. Other researchers, like Ut Na Sio and Thomas C. Ormerod at Lancaster University, have undertaken analysis of a more qualitative kind—of “anecdotal reports of the intellectual discovery processes of individuals hailed as geniuses.” Here we might think of Samuel Taylor Coleridge, whose poem “Kublai Khan”—“a vision in a dream”—he supposedly composed in the midst of a spontaneous revelation (or an opium haze)---before that annoying “person from Porlock” broke the spell. Sio and Ormerod survey the literature of “incubation periods,” hoping to “allow us to make use of them effectively to promote creativity in areas such as individual problem solving, classroom learning, and work environments.” Their dense research suggests that we can exercise some degree of control over incubation, building unconscious work into our routines. But why is this necessary? Our brains typically catalog things by their context: Windows are parts of buildings, and the stars belong in the night sky. Ideas will always mingle to some degree, but when we’re focused on a specific task our thinking tends to be linear. 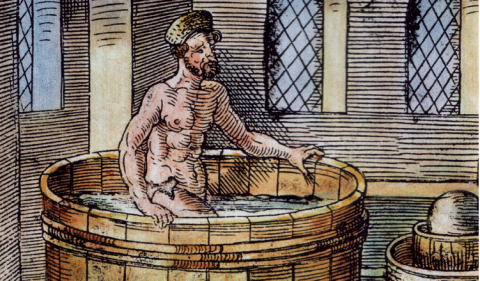 The task of showering—or bathing, in the case of Archimedes (above)—gives the mind a break, lets it mix things up and make the odd, random juxtapositions that are the essential basis of creativity. I’m tempted to think Wallace Stevens spent a good deal of time in the shower. Or maybe, like Stockton, he kept a “Poop Journal” (exactly what it sounds like). “Plan disengagement and distraction.” Widrich calls this “the outer-inner technique.” John Cleese articulates another version of planned inspiration. “Overwhelm your brain: Make the task really hard.” This seems counterintuitive—the opposite of relaxation. But as Widrich explains, when you strain your brain with really difficult problems, others seem much easier by comparison. This article was making sense until it came to the proposition that dopamine is a cause of how we think rather than an effect. Chemicals do not act to change intelligence. They would have to be intelligent themselves to do so. What they must be instead are intelligently constructed elements that act in a regulatory fashion on command. So what’s commanding them? The acquired strategies that our mental functions have been evolved to use. It is of course an extremely complex process that has in effect evolved our physical systems to compete for survival in their innumerably different envirnmnql niches. But I’ve digressed. before post its Itzak Bentov in his book Stalking the wild pendulum discussed relaxing in a hot bath and when ideas would come to him he would write them on small slips of paper and slap them on the moistened walls. Excellent article that explains why I always keep a notebook by my pad and my notes open while I’m on the treadmill! It surprises me how many people say they ‘lose’ that thread of inspiration. As soon as I get one, it ripples through the continuity of my story until it’s impossible not to remember. Excellent article that explains why I always keep a notebook by my pad and my notes open while doing my kitchen work.